Adam Legate netted the only goal of the opening half before Oscar Smith struck to double the scoreline. Lee Threadgold reduced the arrears for the visitors until a twice taken penalty by Jack Wallace sealed victory for the home side. Also gaining local bragging rights were Stevington, 4-1 home winners over AFC Oakley M&DH. Keiran Souter with a brace was joined on the home scoresheet by Martin Danobrega and Antonio Mirti against a lone Elijah Hukin reply. Joining them in the last four are Shefford Town & Campton who won 2-1 at Cranfield United, Jim Burnside and Ryan Lewis netting the vital goals against a United reply from Josh Bamford. The Wootton Blue Cross v Sharnbrook tie fell victim to a waterlogged pitch. The quest for the 2017-18 season league title continues to gather momentum and AFC Kempston Town & Bedford College now find themselves in third spot just goal difference shy of league leaders Shefford Town & Campton after the took their unbeaten ways up to five games with a 2-0 victory at Flitwick Town. Chris Allen and Delroy Phillps netting the goals. Whilst fifth place Crawley Green Reserves maintained their own challenge when an own goal secured them all three points in a 1-0 victory at Queens Park Crescents to extend their unbeaten run to seven games. The Wilstead v Marston Shelton Rovers game was postponed due to a waterlogged pitch. Joining Totternhoe Reserves in the last four are Cranfield United Reserves and Riseley Sports after they both secured home victories. For United it was a 4-1 win over Biggleswade FC Reserves thanks to a brace of goals from Jordan Conway and single strikes from Luke Gray and Callum Riches against a lone reply from Ashley Boness. Whilst the Sportsmen beat Henlow 2-0 with goals from Jack Healey and Josh Poole. The Meltis Albion v AFC Kempston Town & Bedford College Reserves game fell foul to the weather. For third place Wixams it was a missed opportunity to close the gap on the top two sides when they fell to a 3-1 defeat at Sandy who were netting their fourth home win on the bounce. Jonnie Stratford, Liam Brophy and Matt Johnson scored for the home side against a lone reply via Gareth White. Whilst it was a return to winning ways for Cople & Bedford SA who netted a 1-0 home victory over Flitwick Town Reserves thanks to a goal from Lucas Banton. The 61 FC Luton Reserves v Lea Sports PSG game was postponed due to snow. Joining Henlow Reserves in the last four are Wilstead Reserves and Atletico Europa after they both won on the road. For Europa it was a 3-2 win at Sundon Park Rovers where Aaran Van Horn, Mo Banda and Abdul Osman all found the back of the net against Rovers replies via Ethan Tenn and Connor Borino. Whilst Wilstead Reserves went nap in winning 5-0 at AFC Oakley M&DH Reserves. Luke Pursey with a brace being joined on their scoresheet by single goals from Jamie Hall, Dale Clegg and Sam Ward. The Bedford Albion v Westoning tie was postponed due to a waterlogged pitch. For league leaders Henlow Reserves it was an end to their six game unbeaten home run when beaten 5-1 by fourth place Marston Shelton Rovers who are now undefeated in their last 10 starts. Garry Russon and Isaac Vaughan both netting twice and Carl Borromeo once for the Rovers against a lone home reply from James Campbell. Whilst Elstow Abbey climbed up into sixth place with a 2-1 home victory over CS Rovers. All the goals came in the second half, Mark Allen and Dean Leydon shooting the Abbey 2-0 ahead before Daniel Bhatti netted for the Rovers. The Houghton Athletic v Caldecote Reserves game fell foul to a snowbound pitch. The quest for a league and shield double is still on for Kempston Athletic after they moved into the last four with a 3-1 home victory over AFC Kempston Town & Bedford College A. Craig Damon netted twice and Luke Mongiovi once against a lone Town reply from Steven Capener. Whilst also into the last four are Clifton thanks to a 2-1 home win over Flitwick Town A . Trailing to a Ian Buckingham goal in the 19th minute, they were to turn things around in the second period when first Dylan Donaldson netted in the 74th minute and then direct from a corner Jake Brown grabbed the winner two minutes from time. 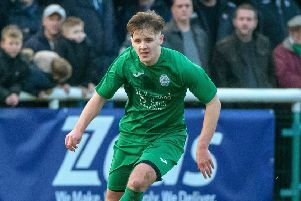 This brought total relief to the home bench that a penalty shoot-out was not required to settle the contest after first in the 59th minute Adam Lawrence had a spot kick saved by Town goalkeeper Dan Howarth and in the 83rd minute George MacMillan blasted another penalty over the crossbar. Elsewhere there was a 4-2 penalty shoot-out win for Bedfordshire Saturday Youth League side Barton Rovers at Bedford Albion Reserves after the sides were deadlocked 2-2 at the end of normal time. Henry Snee netted twice for the Rovers and Adam Wodecki twice for the Albion. With the games Harlington v Caldecote A and Stevington Reserves v Shefford Town & Campton A both failing to beat the weather the lone league action of the day saw Wootton Village and visitors Lidlington United Sports play out a 0-0 draw.